Children's Healthcare of Atlanta Foundation Park North 1577 Northeast Expressway Atlanta, GA 30329 NONPROFIT U.S. Postage PAID Atlanta, GA Permit No. 6722 Visit choa.org/preferences if you wish to opt out of future communications from Children's Healthcare of Atlanta Foundation. This book is printed on paper containing a minimum of 10 percent post-consumer waste and is manufactured in an environmentally friendly manner. We encourage you to recycle this magazine or pass it along to friends so they can learn about Children's. ©2017 Children's Healthcare of Atlanta Inc. All rights reserved. FND 965948.ck.06/17 Small Wonders will be sent directly to your inbox In an effort to better reach you and to consolidate resources, Small Wonders will now be delivered to you electronically. 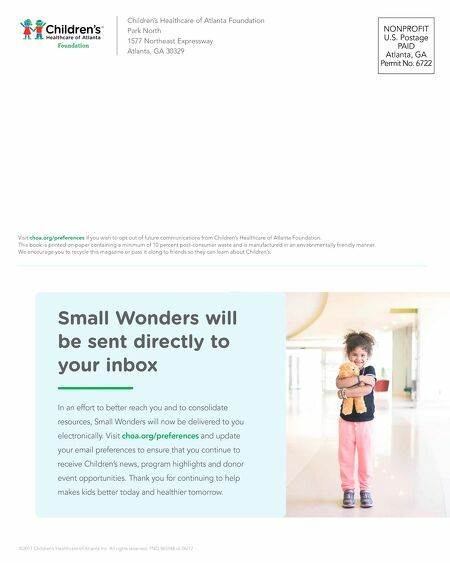 Visit choa.org/preferences and update your email preferences to ensure that you continue to receive Children's news, program highlights and donor event opportunities. Thank you for continuing to help makes kids better today and healthier tomorrow.